Handsome Young Hustler: You look like a nice person. Me (thinking): Don’t hit me for money, Sonny. Me (saying): Looks are deceiving. If you want me to give you the time, it’s 8:02. If you want me to open my wallet, fat chance. Handsome Young Hustler: But I just got out of the hospital! Me: Keep that in mind the next time you go hipster hat shopping. 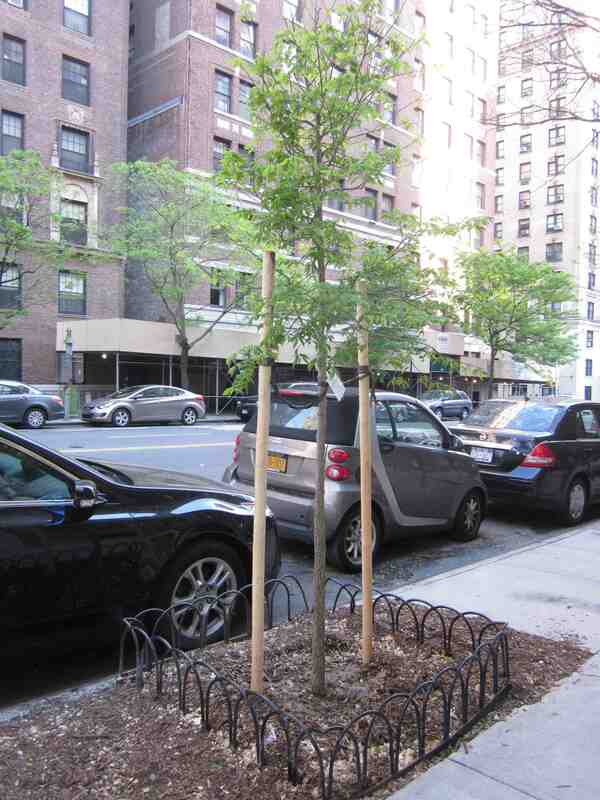 Earlier that same evening I had an infinitely more pleasant encounter with another sapling on West End Avenue. This one was not of the panhandling variety. It was a freshly planted Hackberry tree that I considered worthy of photographing. I restrained myself from snapping any images of the French bulldog evacuating its supper at the tree’s base. Whenever I stop to photograph something, even something as seemingly mundane as this young tree, that’s when people walking along the sidewalk take notice, and punt pups are inspired to heed the call of nature. The dog’s owner did pick up after his relieved beast. A tree name so lovely it inspires fruit craving and loud throat clearing. 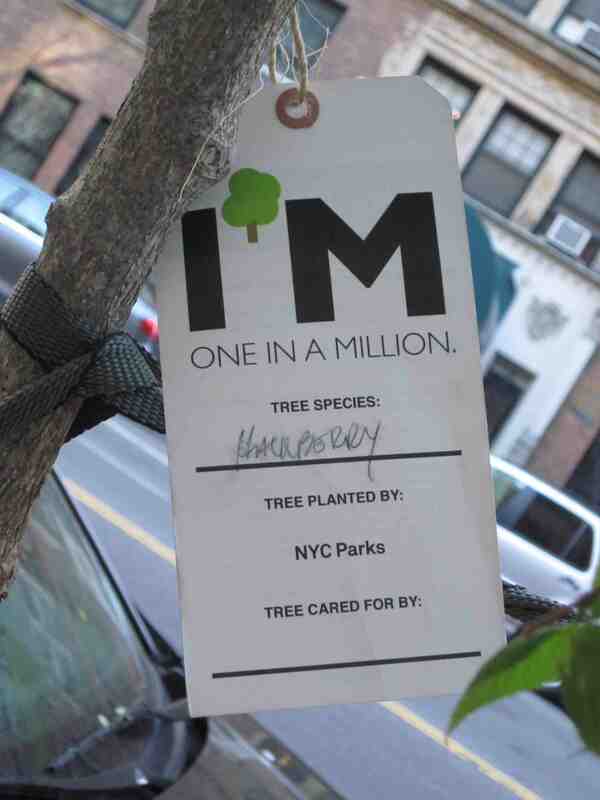 Right now, New York City is in the midst of a project called Million Trees NYC. As the tag declares, this tree is one in a million. Specifically, 220,000 street trees are being planted along with 780,000 others destined for parks and private partners. I think the latter refers to private homeowners who would like to adopt a tree. I would do that myself, but growing a tree in one’s apartment is not an option that this program condones because the people that run it are not mentally defective. Tree care tips tag — can’t wait to see how that’s hanging in March. Me (thinking): Ah, how wonderful, new life! Apparently, the Hackberry, which is planted all over this fine metropolis, is the tree equivalent to the ubiquitous pigeon — my choice for state bird, should anyone ask. I admit that my areas of expertise, tile labeling and sleeping, often done simultaneously, are a bit of distance from having a clue about botany. In fact, I can barely tell the difference between a redwood and a Douglas Fir even if both uprooted and fell on me simultaneously. I do know that were that to occur, it would hurt significantly. Barbara Walters: If you were a tree, what would you be? Me: What else but a Hackberry! We even resemble each other a bit around the rumpled leaves. This entry was posted in Humor, new york city and tagged city life, panhandler, stupidity, tree hugger, tree planting, trees, Upper West Side. Bookmark the permalink. Yes, the lowly hackberry. Doesn’t even have a glamorous name, like Red Maple. However, because it can’t be made into anything worthwhile, it will stand a chance of surviving there. And, remember, that gorgeous little twig of a thing is standing there, quietly, removing the carbon dioxide from the air that we humans spewed out of our cars and leaf blowers. It never asks for anything in return but a little bit of water and sunshine. 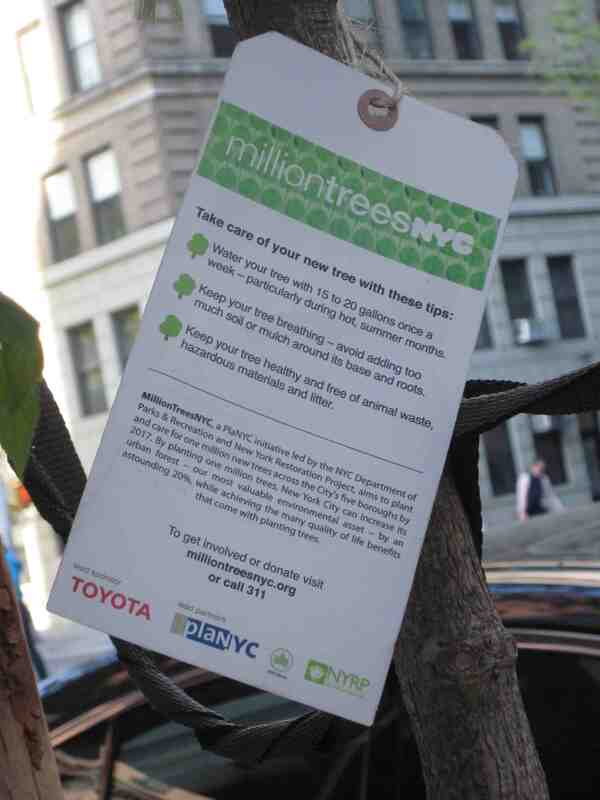 Yay for NYC and their million trees effort! Give your little friend a smile each time you walk by. Good points all Jean. Besides, if my neighborhood Hackberry is doing its job — protecting the environment, there’s no need to see it converted into a baseball bat. Hey, it could be worse. When I grew up in Brooklyn, ginkos and their smelly fruits were all the rage. Of note here though, given the Sandyferous reason for the plantings, how well is the Hackberry known for standing up to high winds? While I don’t know the proper name for them, I *do* know that Philly’s empty lots (and my backyard) are filled with what landscapers refer to as “weed trees” that evidently have very shallow root systems and tend to grow to about 30 feet high and then get blown over in the breeze. Hopefully, some city agency drone did his or her homework, so they know that this little tree will grow into an all-weather survivor Michael. If they didn’t, what a drag that no one had the foresight to ask your opinion. Weed trees are probably the ones that set off my colleagues allergies. Quintessential lame–making sometin outta nuttin. The Hackberry, the Marv Throneberry of trees. Where better than the UWS? Thank you for that observation: “Quintessential lame–making sometin outta nuttin”. I will share this with my niece, Sweet Pea, to ensure that it’s engraved on the urn with my ashes. “Some folks are born into grape nuts and others have grape nuts thust upon them.” That’s going on my headstone. If you can secure the rights from Post. Based on this comment, Pixie, this tree should be called “Sinatra”. That Hackberry provides shade and oxygen, and you, my friend provide wit, intelligence and culture. Valuable traits, indeed! If Babs Walters was a tree, she’d be chopped down and used for kindling. I take it that you share Harry Reasoner’s opinion of his former co-anchor, Jules. That’s such a sweet observation, Russell, to someone that feels a lot like mulch much of the time. Hackberry, sounds like Huckleberry to me, which reminds me of the worse piece of literature ever written by Mr. Twain, I’m a fan of his, but that book was not good at all. We could deduct that he got inspired by a “vanilla” tree to write his book, I can see the relation. Did you ever watch the cartoon bases on Twain’s bad novel? Leo, the only cartoon I can recall watching with Huckleberry in the name was Huckleberry Hound. I suspect that was not the one you were referring to, or was it since I have not read the Twain classic? The Adventures of Huckleberry Finn? Pallets and wine casks are over-rated. Who wants to be a tree and feel the wind on your leaves?! Thanks. I would much rather be a leafy tree than a pallet that’s been hammered with nails and loaded with a ton of whatever, that’s for sure. Sure – being watered by dogs is STILL better than a ton of whatever. Maybe you’ve known you’ve made it the grade in tree-land if you’re the go-to doggy urinal on the block. To the envy of all the other trees! Hello, I just discovered your blog. Happy Belated Birthday! I loved your post you wrote on your b-day. Funny and inspirational! Thanks so much, I’ll look up your book, I am hooked! Thank you for visiting Lame Adventure-land, Christina. I’d further shill my book to you, but I’m not that crass. I had a very happy birthday indeed, aside from a phlegm-filled cough, thanks to recovering from a cold that turned me into the Germinator for a while. My friends and colleagues were all cool about it. Everyone just ran for cover. Out of curiosity I looked Hackberry up in my all purpose garden book and it said it “has the virtue of deep rooting: old trees in narrow planting strips expand in trunk diameter to nearly fill strips without producing surface roots or heaving sidewalk..” It goes on, but it appears to be a reasonable choice to fill a tree lost to Sandy, though I rather like rgayer55’s satire shrub idea. Thank you for adding that bit of research to these comments, Rebecca, and the Hackberry tree thanks you for showing it some love. Hey Audra, WTF u been up to? Not despairing over the BoSox I trust. Nope. Game was great even though they lost. Gotta love Fenway. That’s my girl. We’re starting a new win streak. …or idiot. Whatever. I’m loving it so far. Yea. So far…. How much do we hate the blue jays? A lot. But not this weekend. They’re in the Bronx playing the Yankmees. O Canada, Glorious and Free, we stand on guard, we atns on guard for thee, O Canada we stand on guard for Thee! I’m typing right next to you, Audra. 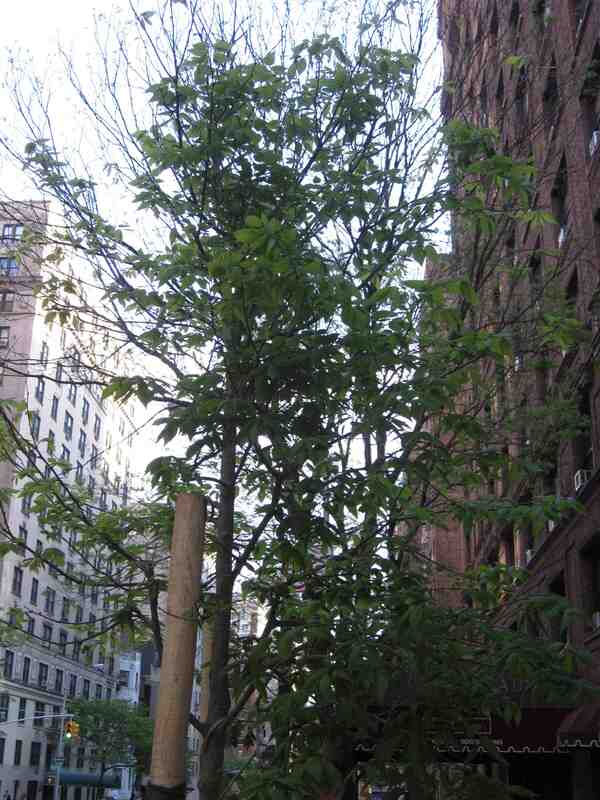 I think it’s kinda cool that they are planting so many trees in NYC…even if they are the carrot top of trees. I think it’s cool, too, Wendy. For a giant metropolis, NYC does make a serious effort to show it cares about the environment. No sneakers on the trees? Nor any bags yet, either, George. You have just elevated the lowly, shy Hackberrry to a new level of celebrity! Long may it cast shade! Hmm, could it be a slender tome written in pencil by the human equivalent of a Hackberry, Patricia? Apparently, you visited the Lumber Board’s site. All that talk of usefulness for making stuff–p’shaw. I read that it holds up well in urban conditions. Which is more than I can say for myself. True, I could visit the lumber boards site, but I prefer to surf IMDB. I agree with you, if it grows up to survive all the ills in the NYC environment, I give it a big seal of approval. A million urban chia pets could have potential, though. A million urban Chia pets sounds like an installation at MoMA over here. I pledge to install it if I win the Powerball. The pressure is on for you to win! Guat, it surprised me, too, that the Hackberry got such crummy reviews. I agree with you. It’s a New York tree and that’s completely badasss. If I’m a badasss, it’s more by extension from knowing you. The Cha Cha Cha Chia of trees is quite the analogy … but here’s the biggest text: it is worthy of bag decorating? It’s premature, Frank. It’s just a baby tree! … Now that I’ve said that here, the next time I walk past it, it will have three stuck in its young leaves for life. One would hope the roots grow down rather than spreading outward on that sort of tree or street and sidewalk repairs may be needed a few years down the road. Spot on point! I hope that the NYC tree brain thrust thought of that, too! I look forward to your post on the first bag that winds up in that tree. Stay tuned. Your prayers might be answered. I guarantee I will have an eye on that tree specifically to write that post for the rest of my life. Suburbia: Where they cut down trees and name streets after them. That’s calling it like it is! Here in NYC, we have streets with names like Lispenard,named after a Huguenot, ad a bit more snore inducing than names like Maple, Cedar or Oak. A tree is a tree, and I’m trying to think if there is a tree I don’t like. It is true that Phil has just cut down a rhodedendron from outside the fence in the forest, but they have their stunning moments. The elder is frowned on here, but it is tough as nails and brings greeness to the humblest yard, and berries which can make wine. Ah, nature’s a grand thing wherever it goes. Ah! Fellow tree-lover Kate, to get Jerry Maguire here, you had me with “berries which can make wine”. It’s now the unofficial mascot tree of Lame Adventures. Coincidentally, there’s a famous bronze statue of a bear and a tree in a famous square of Madrid which is something of a national symbol for Spain. Apparently there used to be many bears around Madrid and the tree, which was once thought to be a strawberry tree, was discovered to have actually been a Hackberry tree which was once in abundance around Madrid. And clearly made for a much better statue than a Flamenco Chia Pet. I love this factoid brought back from your recent travels to Madrid. Meanwhile, my head is reeling over how the Spaniards could have possibly mistaken hackberries for strawberries. Especially as everyone knows that strawberries grow atop sponge cake shells with whipped cream. Silly Spaniards. I’ve noticed a few of these “one in a million” trees in my neighborhood too. I wanted to look into it a bit more and found that the Divine Miss M was one of the founders of the program. Way cool! She is way cool, Jackie! Are the trees in your neighborhood also Hackberries? If it’s not wearing a tag, Jackie, I’m clueless about its species, too. Talk about the Baader-Meinhof effect! If I’d read this post immediately after it was published, it would have been the first time I’d been aware of hearing about Hackberry Trees. However, I saw the plant mentioned in a book sometime within the last 48 hours, and now this post is the THIRD time I’ve heard hackberries mentioned. Obviously, it’s a lot more common than I realized, and just haven’t been paying attention. Baader-Meinhof–the krauts have a term for everything. I think the tree-planting idea is a lovely one. I’m no granola, but I enjoy trees. I’ve only been to New York a couple of times, and my mental picture of Manhattan is pretty treeless (except for Central Park, of course–packs of wilding teens need SOME shadows to lurk in, after all). It’s nice to see that my picture is wrong (although I’m awfully fond of my prejudices, so I’ll continue to think of Manhattan as a soulless concrete jungle–watch out for alligators!). Brooklyn was a lot greener than I’d expected, my previous impressions of the city based on the opening credits to Welcome Back Kotter. Also, I like that you include street names in your stories. I’m a map dork, and I travel vicariously, so it’s fun to see where things happen. Possibly the Hackberry is the official tree of the blogosphere, Smak, even though I’m sure most bloggers consider themselves to be more like mighty oaks than a modest sapling that bears useless fruit. To me, Manhattan isn’t soul-less at all, but it is heavily populated. Even in densely crowded conditions, there are isolated moments of connection. Tonight on the crowded uptown express train ride home, I was standing in front of a striking 20-something woman with tattoos running down her toned right arm (it was humid so she was wearing a sleeveless shirt). A guy, also 20-something, got on at 34th Street. They instantly noticed each other. The doors shut. The train headed toward 42nd Street Times Square. The guy asked the tatted chick, “Did you get those all at once or over time?” She said, “Over time.” She smiled. He didn’t. He looked like he was trying to figure out what to say next. The guy sitting next to the woman got up. The seat was near me so I took it. The thought occurred that I should have let the guy sit next to the tatted chick because I sensed chemistry between them. Then I reflected, “I’m not a matchmaker. It’s their job to serve and volley.” He got off at the next stop, 42nd Street, so that was the end of the affair. But it was fun while it lasted. I love where you’ve acquired your knowledge about Brooklyn.